Fresh off of the first West Coast League Championship Series appearance in franchise history, the Victoria HarbourCats are proud to announce that left-hander Jack Owen has been named 2017 WCL Pitcher of the Year. Additionally, five HarbourCats have been named to post-season All-WCL teams. Owen led the WCL in starters’ ERA (1.01) in seven starts and was tied for seventh in strikeouts (48) in 44.1 innings pitched, while allowing just 29 hits. The incoming freshman to Auburn University (SEC) finished two back of the league lead in wins, working to a 4-1 record. Owen was named to the WCL All-Star Game in July. In addition to Owen being named to the All-WCL First Team, four HarbourCats were named All-WCL Second Team. Shane McGuire, C: The incoming freshman to the University of San Diego (WCC) was named the HarbourCats’ Player of the Year. McGuire led the HarbourCats with his .451 batting average; tied for second on the team with 26 RBIs, and contributed six doubles and four home runs in 26 games. Hunter Vansau, OF: The rising junior from Mississippi State (SEC) hit .359 with a team-leading eight home runs and 34 RBIs. Vansau participated in the WCL All Star Game, and was the runner-up in the WCL Home Run Derby. 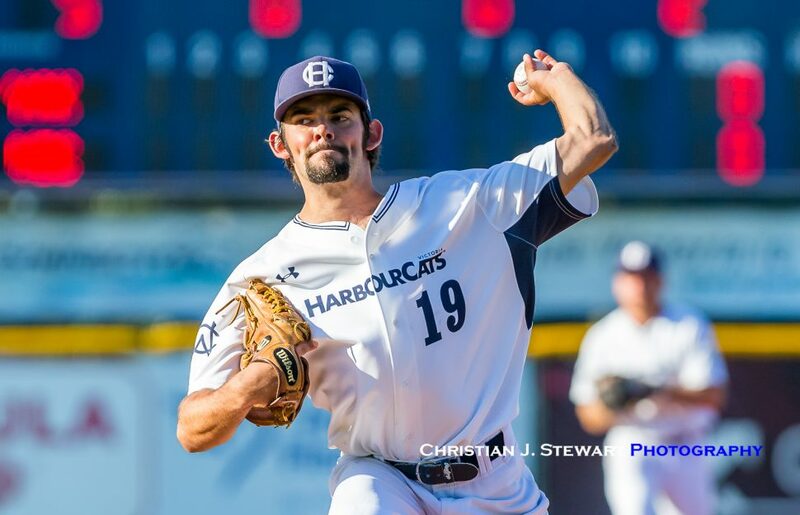 Adam McKillican, SP: The rising sophomore from the University of British Columbia led the HarbourCats in starts (eight) and his 58 innings pitched was fourth in the WCL. He also tied for the team lead in wins, one back of the league lead, posting a 5-3 record with a 4.03 ERA en-route to being named HarbourCats co-Pitcher of the Year with Owen and being selected to the WCL All-Star Game. Travis Kuhn, RP: A redshirt freshman from the University of San Diego (WCC), Kuhn finished second in the WCL with nine saves. He led the league with 24 appearances, and recorded 41 strikeouts in 31 innings pitched. HarbourCats named All-WCL Honourable Mentions were Harrison Bragg (IF), Harry Shipley (IF), Andrew Shaps (OF), and AJ Block (SP). Bellingham: Austin Pinorini, Brendan McClary, Max Flower, Kyle Stowers, Zach Pettaway, Trevor DeLaite, Arman Sabouri, Josh Zavisubin. Bend: Charlie Maxwell, Cal Waterman, Matt Kroon, Derek Chapman, Grant Larson. Corvallis: Matt Kelly, Chad Stevens, Troy Claunch, Emilio Alcantar, Cason Cunningham, Ross Massey, Connor Redmond, Trenton Toplikar, Jacob Fricke, Miles Glazier, Hazahel Quijada. Cowlitz: Austin Merrill, Corbin Powers, Davis Baillie, Kragen Kechely, Nick Strange. Gresham: Alec de Watteville, Jordan Barchus, Robert Reaser, Alex Roth. Kelowna: Niall Windeler, Sam Menegat. Port Angeles: Austyn Tengan, Jake Portaro, Brody Kato, Kevin Kendall, Taylor Adams, Nick Bonnikesen, Luke Fralely, Wyatt Haccou, Cam Walker. Victoria: Harrison Bragg, Harry Shipley, Andrew Shaps, AJ Block. Walla Walla: John Glenn, Jacob Blas, Vinny Capra, Danny Sinatro, Jake Suddleson, Tim Josten, Haydn King, Darius Vines, Matt Amrhein. Wenatchee: Adrian Dalma, Jake Taylor, Jacob Prater, Dugan Shirer, Hunter Boyd, McKabe Cottrell, Cameron Kurz. Yakima Valley: Dillon Plew, Jonny DeLuca, Tora Otsuka, Steven Sordahl, AJ Landis, Isaac Mullins, Josh Tedeschi, Dustin Yates. 2018 season ticket renewals and sales are now available including the highly popular Campbell Real Estate Club. Tentative plans are in the works to expand the new home plate seating section from two to four rows of padded seating. 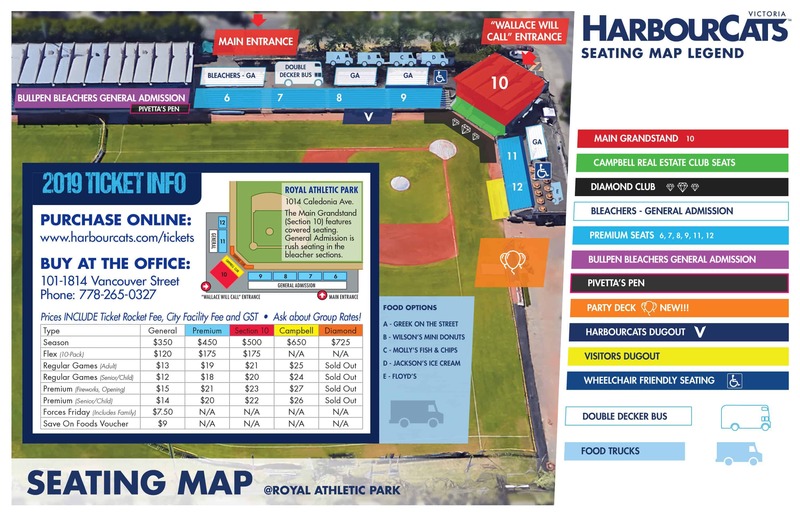 Visit the HarbourCats office at 101-1814 Vancouver Street or call (778)-265-0327 to purchase season tickets or for more information. You can also email brittany@harbourcats.com for further details, or go to the team website at harbourcats.com. The HarbourCats office is located at 1814 Vancouver Street (Phone: 778-265-0327). Office hours are 9:00am – 5:00pm, Monday to Friday.